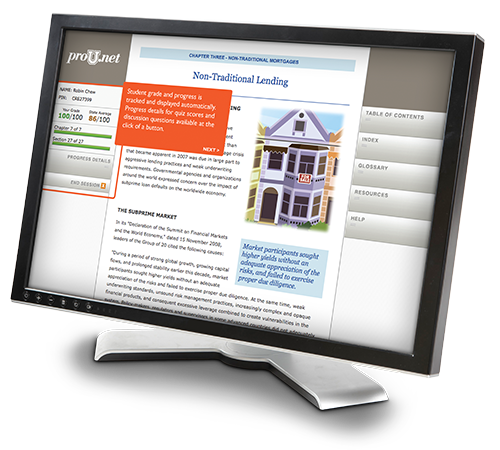 Kaplan has partnered with proU.net to offer this complete online mortgage licensing package to help you become licensed as a Mortgage Loan Originator. This mortgage training class satisfies the national SAFE educational requirements, including the required 3 hours on Federal Law and Regulations, 3 hours on ethics, 2 hours on nontraditional mortgages and 12 hours of electives. We focus heavily on federal law due to the rigor of federal law found in the National Exam. This 20-Hour SAFE Comprehensive course is approved by the NMLS and meets federal Mortgage Loan Originator (MLO) pre-license education requirements as required by the SAFE Act. This course covers the National components of the state licensing examination. It is presented in an online instructor-led format similar to a college-level online course. The presence of an instructor/facilitator will allow you to learn from the expertise and experiences of the instructor to become more fully prepared to work within the mortgage industry. As your NMLS-approved course provider, we will transmit your completion record to the NMLS. The NMLS charges $1.50 per credit hour to bank your credit hours. $30 ($1.50 x 20 hrs.) will be added to your order when you enroll. You will see upcoming class start dates on a subsequent screen. Please note this course does not cover state-specific content, which may be required for certain states. Finish Fast – Complete your entire requirement in as little as one week! Easy Access – You can access the course 24 hours a day. Instructor-led– Highly trained Kaplan instructors will guide you through the course from day 1 to ensure your success! Interactive Assignments– Unique and comprehensive assignments are designed to ensure maximum cyber interaction between students and instructors. You will complete daily tasks as assigned by your instructor.